World Series Of Fighting Announces Monumental New Years Eve NYC Show » MMA H.E.A.T. Today World Series of Fighting (www.WSOF.com) announced a stacked eleven-bout fight card for the unprecedented New Year’s Eve world championship extravaganza at The Theater at Madison Square Garden in New York City. The WSOFNYC mega-event boasting an unmatched roster of world-class athletes will air live on NBC Sports (3p.m. ET – 4p.m. ET on NBCSN, 4p.m. ET – 6p.m. ET on NBC) on Saturday, December 31. In the main event, undefeated lightweight (155 pounds) kingpin Justin “The Highlight” Gaethje (16-0) defends his crown against Joao “The Brazilian Samurai” Zeferino (20-8) and, in the co-main event the highly-anticipated welterweight (170 pounds), reigning world champion Jon Fitch (28-7) squares off with number one contender and fellow decorated superstar Jake Shields (31-8). Reigning bantamweight (135 pounds) champion Marlon Moraes (16-4) will also put his title on the line against ferocious contender Josenaldo Silva (25-4). Light Heavyweight and Middleweight Champion David Branch (19-3) will put his Middleweight (185 pounds) belt on the line against challenger Louis Taylor (13-1). In addition to the main event, World Series of Fighting announced that heavyweight champion Smealinho “The Prince” Rama (9-2) will make his return to the decagon at a new weight class of Light Heavyweight (205 pounds) against Jake “The Honey Bear” Heun (9-4). Former top 10 world-ranked Yushin “Thunder” Okami (32-10) will take on battle-tested Paul Bradley (23-6) in a welterweight affair. Shane Kruchten (11-4) and Jeremy Mahon (5-4) – both U.S. Marine Corps veterans – will do battle in a 150-pound “Who’s The Toughest” catchweight contest. Former UFC standout Jared Rosholt (14-3) will make his much-anticipated promotional debut against fellow World Series of Fighting newcomer and finisher Caio Alencar (9-1) in a featured heavyweight contest. Tickets for WSOFNYC go on sale on October 28, at the Madison Square Garden box office as well as online at Ticketmaster.com and WSOF.com. 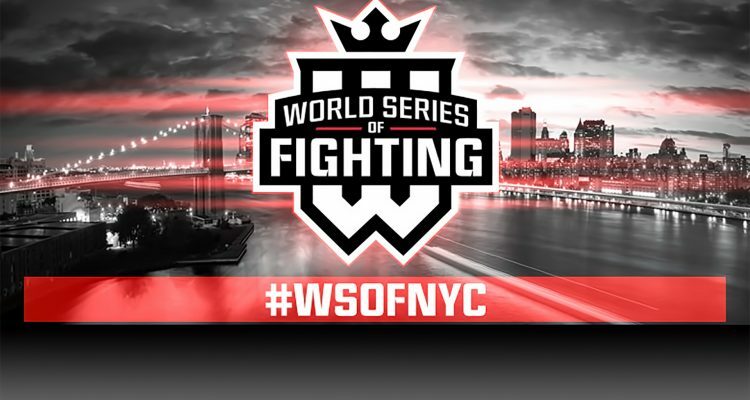 Pre-sale information is available at www.WSOF.com/WSOFNYC. “The debut of World Series of Fighting in New York City promises, without a doubt, one of the most monumental fight nights in the history of the sport.” said World Series of Fighting CEO Carlos Silva. Legendary Mixed Martial Arts (MMA) artists Bas Rutten and Renzo Gracie will call the action live on NBC from Madison Square Garden in New York City. No Comments on "World Series Of Fighting Announces Monumental New Years Eve NYC Show"